I have always been intrigued by the Navy SEALs. 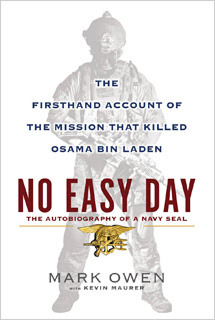 When I heard about the controversial new book written by a SEAL who was on the raid that killed Bin Laden, I knew I would buy it. And I did buy it as soon as I saw it for sale at my local book store. The book was nearly impossible to put down as soon as I started reading it. The writing is smooth and easy to understand. All of the military jargon terms are explained, and it almost feels like you are wearing 60 pounds of gear and $65,000 night-vision goggles while sitting next to Mark Owen (his pen name) on a cramped helicopter flight to the next mission. I have always appreciated military culture and customs, since so many people in my own family have been enlisted. It made me want to enlist just so I could have comrades like the ones Owen writes about. I was particularly interested in some of the details of the missions, like how an assault team might decide to attack from the roof of a building or why they might land on the ground and sneak up on foot instead. I enjoyed reading about the specific gear and tools that the SEALs sometimes take along with them during an assault: a sledgehammer, bolt cutters, $200 in cash in case they need to bribe someone for a ride. I also wanted to read about Bin Laden's final moments. Owen describes him as a coward, not wanting or willing to fight even though his family was home and he had access to guns. The story was believable and well-told. I was particularly touched with Owen's recollection of a CIA analyst he called "Jen." She had been tracking Bin Laden for five years, and she was quite emotional when the SEAL team brought his body back from Pakistan. It's easy to see what sorts of frustrations elite military teams like the SEALs have to deal with when bureaucrats get involved in their missions. Owen talks about having to eventually use a bullhorn during raids to ask alleged terrorists to "come out" of their houses, only to see the same people pop up again and again during other raids. Humanity and ethics certainly have an important role whenever the military is involved, but it is easy to have empathy for front-line commandos like Owen when their lives are so clearly dependent on them being able to enter, execute, and leave quickly. This book gets my highest rating: it's a must-read!